One of the other early notable players in the early development of Boyle Heights was John Edward Hollenbeck, of whom and his wife Elizabeth, there will be a separate post here soon. The Hollenbecks were successful business people in Nicaragua for some twenty years before moving to Los Angeles in 1876, just as Boyle Heights was being launched by William H. Workman, John Lazzarovich, and Isaias W. Hellman. Seeing opportunity in the new tract, Hollenbeck became an investor and developer and was a partner of Workman in subdividing property in the community. Hollenbeck also had property in downtown Los Angeles, on which he built, at the southwest corner of Second Street and Broadway, the Hollenbeck Hotel block, and owned a few thousand acres of Rancho La Puente in the eastern San Gabriel Valley, as well. But, he died in 1885 after less than a decade in the area, though his widow continued to manage his investments, established (with William H. Workman) Hollenbeck Park in her husband's memory, and resided in the large estate the couple built at 573 S. Boyle Avenue in Boyle Heights. 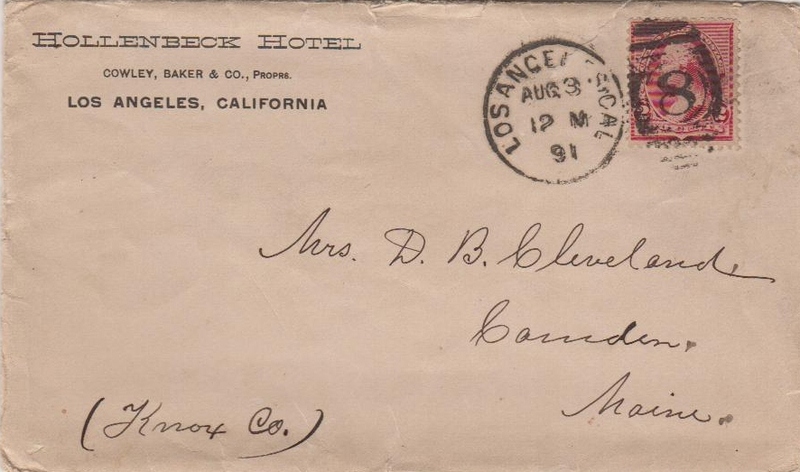 The first page of a six-page letter from George W. Simonton, business manager for Elizabeth Hollenbeck, to his sister, Dorcas Simonton Cleveland, on Hollenbeck Hotel stationery, but written from the Hollenbeck residence in Boyle Heights, 2 August 1891. Courtesy, Workman and Temple Family Homestead Museum, City of Industry. 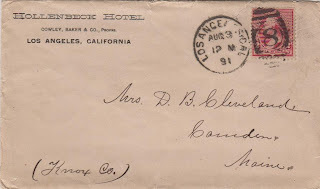 Recently, a fascinating six-page letter and envelope on Hollenbeck Hotel stationery and a hand-drawn map of downtown Los Angeles was acquired by the Workman and Temple Family Homestead Museum in City of Industry. Dated 2 August 1891, the correspondence was from George W. Simonton to Mrs. D. B. Cleveland of Camden, Maine. 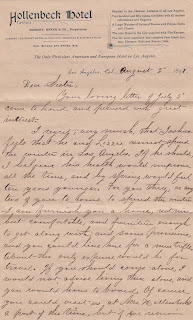 The missive is mostly concerned with an encouragement from Simoton to his sister, Dorcas, to come out to Los Angeles to stay during the ensuing winter of 1891-92. For many years, it was common for people from the colder Midwest and East regions of the United States to "winter" in the Los Angeles area and, while this is more famously connected with the wealthy who spent their winters in Pasadena, Santa Monica, Redondo Beach and other tony areas, there were middle-class folks who did the same under less lavish conditions. 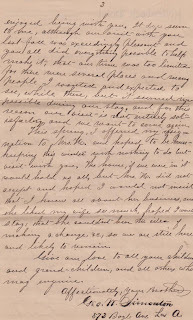 What leapt out from the letter, however, was a statement at the bottom of the first page, when Simonton, starting his push for his sister to come out, wrote, "Of course you could visit us at Mrs. Hollenbeck's a part of the time . . ." This invited a little research to determine what Simonton's connection was to Elizabeth Hollenbeck, because with the document on hotel letterhead, it first appeared to be from a visitor to town. 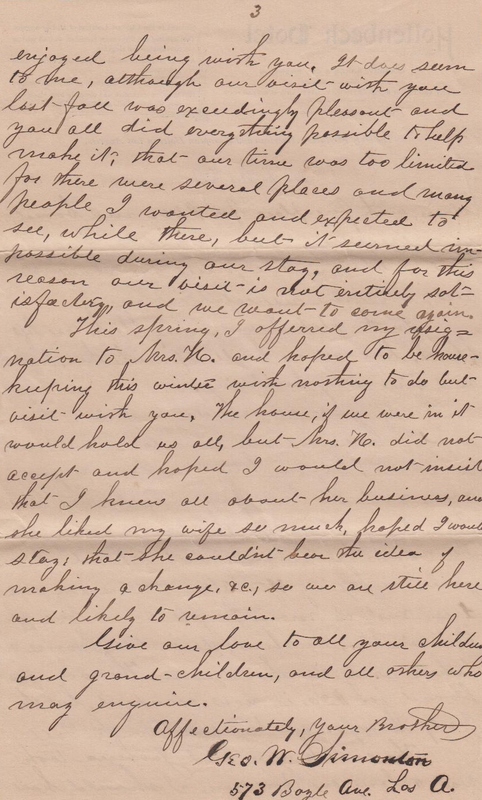 The last page of the letter discussing Simonton's rejected offer of resignation to Mrs. Hollenbeck and showing her address at 573 Boyle Avenue. After some poking around, however, the story emerged. George Simonton was from Camden, Maine, a seaside town in the center part of that picturesque state about 100 miles north of Portland. Married and with several small children, he made the long migration all the way across the country to Gold Rush-era California in the latter 1850s and took up residence in Vallejo, northeast of San Francisco. There, Simonton became a noted educator, teaching and then administering the public schools in that city, as well as being a prime mover in the establishment of the local orphanage. By the mid-1880s, however, Simonton, who was about 60, made his way down to Los Angeles, just prior to the massive land and population boom commonly called the "Boom of the Eighties." Not long after his relocation, he became the business manager for the newly-widowed Elizabeth Hollenbeck and her substantial estate. The envelope with the Hollenbeck Hotel name and names of proprietors, Cowly, Baker and Co.
As expressed in the 1934 book, A History of Hollenbeck Home by William Stewart Young, a Hollenbeck confidante, John Hollenbeck's death created a situation in which, "many demands were such as required a man to look after [her interests], [so] Mrs. Hollenbeck employed a business manager with whom to consult and to carry out her directions." An initial attempt at working with someone proved to be a failure, so, "she changed to the plan of bringing an experienced man and his wife into the home to take the responsibility of the business and a portion of the household cares . . . Mr. George W. Simonton now becaeme the business manager and with his wife resided in the home." The wife in question was Simonton's third wife (he was twice widowed), Jane Leiter. Simonton, however, wrote his sister in August 1891, that, "this spring, I offered my resignation to Mrs. H. and hoped to be housekeeping this winter with nothing to do but visit with you . . . but Mrs. H. did not accept and hoped I would not insist, that I knew all about her business, and she liked my wife so much, hoped I would stay, that she couldn't bear the idea of making a change, &c, so we are still here and likely to remain." The reason for his desiring to leave was likely retirement, as Simonton was 67 years old and the demands of managing a large estate for several years probably took its toll. As it was, he continued on for almost five more years until Elizabeth Hollenbeck made a significant change to her estate by creating what was then called the "Hollenbeck Home for the Aged," a retirement facility on the grounds of her property that opened in the summer of 1896. Simonton's hand-drawn map of downtown Los Angeles from First to just beyond Sixth and from Los Angeles to Hill streets and notations of churches, theaters, business buildings, the city hall, and other notable features. Click on this or the other images to see them in a larger view in a separate window. Stewart wrote that, "the business part of the enterprise having been carefully handled by Mr. Simonton, after ten years of service he resigned and built himself a home nearby, into which he and his wife moved." Although then in his early seventies, Simonton did not exactly ease into a total retirement. As noted by Young, "Mr. Simonton was elected to membership in the city school board and served with fidelity and genuine interest for a number of years." Young further noted that "in the earlier days of his life he had been a teacher and his love for the cause of education never waned." With respect to Simonton and his longtime employer, Young noted that, "the close relationship of the years had begotten a friendship that was mutually prized," a sentiment certainly found in the letter. The document also has a very detailed description of a part of Los Angeles in which Simonton did some research for his sister about a suitable boarding house (that was "not nice but comfortable") on the west side of Broadway between Second and Third streets and which would run between $30 and 45 a month for room and board. He also spent some time letting her know the amenities of the area, to calm presumably any qualms she might have had about living in a big city that was a far cry from little Camden, Maine. In his description he noted the new city hall across the street from Mrs. Locke's boarding house, which was "a magnificent stone and brick structure, in which are all the city offices, the public library, &c." He also described the vicinity as having a bath house, the Jewish synagogue, several Christian churches, the YMCA, elegant houses (including that of Mrs. Hollenbeck's lawyer, John D. Bicknell), business blocks, the Post Office, and, of course, the Hollenbeck Hotel building. Also of note was his reference to the fact that the boarding house he recommended was "along side the cable road, on which you can go to every part of the city, and to any part for five cents." Moreover, he continued, "this road coems to Boyle Heights, near to Mrs. Hollenbeck's," which would obviously prove convenient for visits. 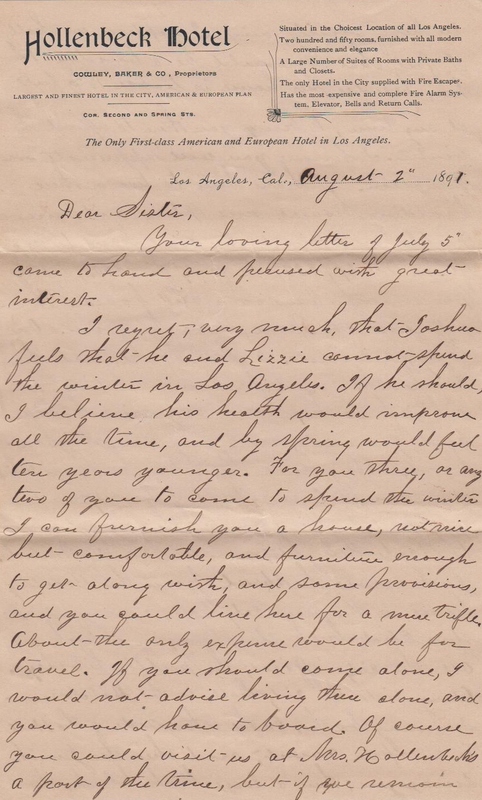 In all, this letter and map are full of interesting information about 1891 Los Angeles and Boyle Heights and a little more to the story of the community in which Elizabeth Hollenbeck, whose endowed institution is now called "Hollenbeck Palms," played a notable role.